There are three levels in the conversation course, beginner, intermediate, and advanced plus one theme based course. Please register to have access to all PDF transcripts of each lesson. The Hmong Conversation course is designed for any non Hmong who have little or no exposure to the Hmong language and is also highly recommended for any native Hmong student who has lost the fundamental and/or the basic everyday usage of the Hmong language. The main objective of the course is to help students develop skills in reading, listening, and speaking Hmong. With three levels to the course, Beginner, Intermediate, and Advanced, students will not only understand the basic usage of the Hmong language, but will also gain great knowledge of the Hmong culture and traditions. 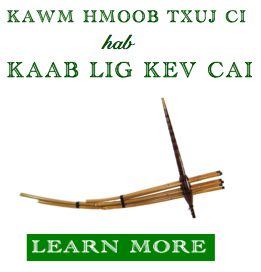 Each level consists of 30 lessons that cover a wide variety of topics from modern usage of the language to the traditional usage and thoughts of the Hmong language and its people. 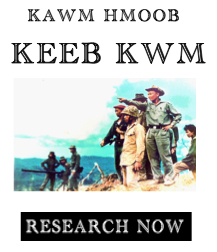 For now, the Conversation course is only offered in White Hmong (Hmoob Dawb). A Green Hmong (Hmoob Ntsuab or Hmoob Leeg) course will be created if people ask and demand for it. Each lesson is designed with an average of 30 to 40 new vocabularies and words that are meant for student to study one lesson per week, one hour a day, with a total of at least three hours. Student should spend at least one hour on listening, one hour to practice speaking, and another one hour reading the dialogue and vocabularies. There is also one translation worksheet for each lesson. The course is written with a connected storyline about a diverse group of students string together all the dialogues and narratives in the lesson through the entire course. The relationships among the main characters are carefully scripted. The goal is for students to get to know the characters well and to find out how things develop among them. By getting to know more about each cast member, the students will be more involved in the process of learning the language. In hope of keeping pace with the modern usage of the Hmong language and enhancing students’ ability to communicate, the vocabulary items and expressions in the Beginning level of the course are kept to those of frequent use only. Toward the end of the Intermediate level and into the advanced level, more complex words and expressions will be introduce with full explanation of its usage. Vocabulary in each lesson builds up from the previous lesson and a glossary of all the words will be present at the end of each section that contains five lessons. Theme – In each level, there are six different sections with its own theme, which contain five different topic lessons. The entire theme is itself a big conversation among the characters. Each lesson is broken up into different topics that correlate with the overall theme. Setting – Each dialogue starts out with a setting description to introduce the place, the cast of characters, and what their conversation will contain. In the Beginner level, the setting will be in English. In the intermediate and Advanced level, all setting will be in Hmong. Dialogue – The dialogue between the cast of characters is carefully written to reflect each character with correlation to the lesson’s topic and the theme of the section. Vocabulary – The vocabularies are number chronologically to their usage from the dialogue. Each vocabulary set comes with an English translation along with a list of proper nouns at the end. A total count of new vocabulary at the end of each lesson is also provided. Helpful and Interesting Notes – Each lesson comes with about four or five helpful and interesting notes. Because there is no real grammatical structure in the Hmong language, the grammars within the Hmong language are expressed according to the way the language is spoken. This area will contain some grammars, tips, and usage of words. Translation of Dialogue -In each lesson, a translation of the dialogue will be provided toward the end of the lesson. Progress Checklist – At the end of each lesson, a checklist will be provided and students are suppose to reflect their learning according to the checklist. In order for students to move on with the next lesson, they must fully understand the words and the dialogue within that lesson. Students should review again and for as many times as necessary if they are having difficulties with any lesson. The translations and listening comprehension worksheet is provided in order for students to develop understanding skills and listening skills of the language. There will be translation from Hmong to English and English to Hmong. The listening portion will consist of listening to a short dialogue and answering questions in English. Students will also listen to a sentence and be asked to choose the correct response to the sentence. Each lesson comes with an audio recording of the dialogue, vocabulary, and translation worksheet. Students should use the recordings to check for correct pronunciation of words and the dialogue. When listening to the audio, students must practice speaking at the same time. I designed this Hmong Conversation course in order to help others learn the Hmong language and understand its beautiful and rich culture and traditions. The Hmong has a population of over 300,000 in the United States and over 12 millions around the world, and yet, not many people know who the Hmong people are. Hopefully, this course and the website will not only encourage non Hmong to learn and study about the Hmong but also help our young Hmong high school and college students to retrieve and retain the Hmong language. As I spent an enormous amount of time learning and researching other languages, I noticed that not a single publication was made to help others study Hmong. Hmong is not a rarely used language. There are many of us that speak Hmong in the United States. But because no publications or resources were made available out there, it makes it seem as though Hmong is a rarely used language. Hopefully, this course and the website will change that view and perspective. Lastly, I would like to encourage all non Hmong and native Hmong speaker to support and encourage others to learn and study the Hmong’s language, its culture, and traditions. Thank You!